tops sports men and women would be competing in 100% polyester? 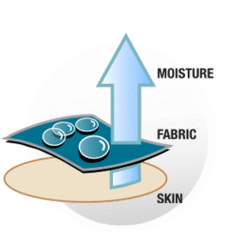 The secret to the success of performance polyester fabrics is moisture management and breathability. Luxury Crepe - A superior quality performance polyester with high twist yarn, Pinhole Technology for free air flow and stretch for comfort and crease recovery. This fabric has a wonderful, fluid drape and is exceptionally durable. Wash at 40 degrees, use softener in the rinse cycle and hang to dry. Do not tumble dry. Pro-stretch - A lighter, performance polyester with lycra for stretch, comfort and crease recovery. Easy care. Wash at 40 degrees and hang to dry. Do not tumble dry. Linen-look - A natural looking performance fabric with a cross hatch texture in the weave for companies that prefer the look of natural fibres, but with the performance ability of polyester. Wash at 40 degrees and hang to dry. Do not tumble dry. If ironing is required, press on a low setting on the reverse side of the fabric.